There is a statue of the goddess Artemis housed in the Vatican Museum. 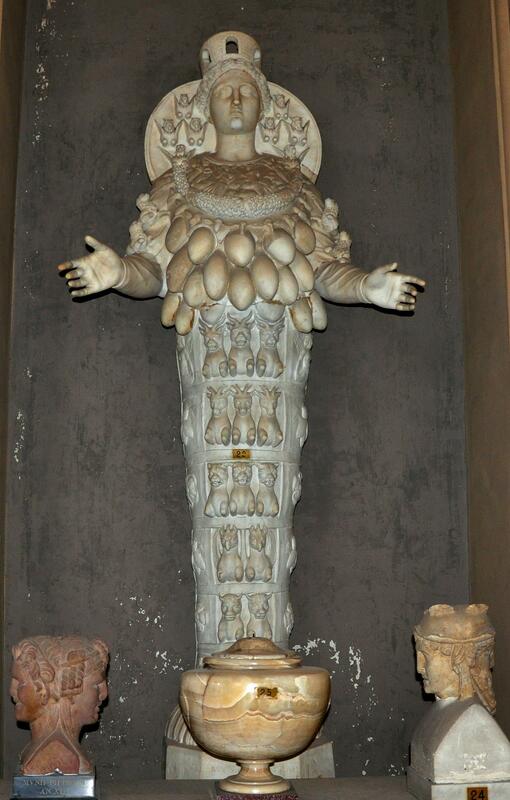 Goddess Artemis in Vatican Museum. Photo by Leon Mauldin. About that time there occurred no small disturbance concerning the Way. For a man named Demetrius, a silversmith, who made silver shrines of Artemis, was bringing no little business to the craftsmen; these he gathered together with the workmen of similar trades, and said, “Men, you know that our prosperity depends upon this business. You see and hear that not only in Ephesus, but in almost all of Asia, this Paul has persuaded and turned away a considerable number of people, saying that gods made with hands are no gods at all. Not only is there danger that this trade of ours fall into disrepute, but also that the temple of the great goddess Artemis be regarded as worthless and that she whom all of Asia and the world worship will even be dethroned from her magnificence.” When they heard this and were filled with rage, they began crying out, saying, “Great is Artemis of the Ephesians!” (verses 23-28). She may, however, be identified with the Cybele of the Phrygians whose name she also bore, and with several other deities who were worshipped under different names in various parts of the Orient. In Cappadocia she was known as Ma; to the Syrians as Atargatis or Mylitta; among the Phoenicians as Astarte, a name which appears among the Assyrians as Ishtar; the modern name Esther is derived from it. The same goddess seems to have been worshipped by the Hittites, for a female deity is sculptured on the rocks at Yazili Kaya, near the Hittite city of Boghazkeui. It may be shown ultimately that the various goddesses of Syria and Asia Minor all owe their origin to the earlier Assyrian or Babylonian Ishtar, the goddess of love, whose chief attributes they possessed. The several forms and names under which she appears axe due to the varying developments in different regions. Tradition says that Diana was born in the woods near Ephesus, where her temple was built, when her image of wood (possibly ebony; Pliny, NH, xvi. 40; Acts 19:35) fell from the sky. Also according to tradition the city which was later called Ephesus was founded by the Amazons, and Diana or Cybele was the deity of those half-mythical people. Later when Ephesus fell into the possession of the Greeks, Greek civilization partly supplanted the Asiatic, and in that city the two civilizations were blended together. The Greek name of Artemis was given to the Asiatic goddess, and many of the Greek colonists represented her on their coins as Greek. Her images and forms of worship remained more Asiatic than Greek. Her earliest statues were figures crudely carved in wood. Later when she was represented in stone and metals, she bore upon her head a mural headdress, representing a fortified city wall; from it, drapery hung upon each side of her face to her shoulders. The upper part of her body was completely covered with rows of breasts to signify that she was the mother of all life. The lower arms were extended. The lower part of the body resembled a rough block, as if her legs had been wrapped up in cloth like those of an Egyptian mummy. In later times her Greek followers represented her with stags or lions standing at her sides. The most renowned of her statues stood on the platform before the entrance to her temple in Ephesus. As the statues indicate, she impersonated the reproductive powers of men and of animals and of all other life. We have previously referenced Artemis in posts here, here, here and here. This entry was posted on Saturday, August 23rd, 2014 at 11:39 AM and is filed under Bible History and Geography, Bible Study, Italy, New Testament, photography, Roman Empire, Rome, Travel, Turkey. You can follow any responses to this entry through the RSS 2.0 feed. You can leave a response, or trackback from your own site.